I completed my eighth quilt nearly a year ago (time flies!!). This was done for my very good friend Tabatha who's seen me through many rough times and holds a special place in my heart and life. Can you guess her favorite color? Yep, PURPLE! 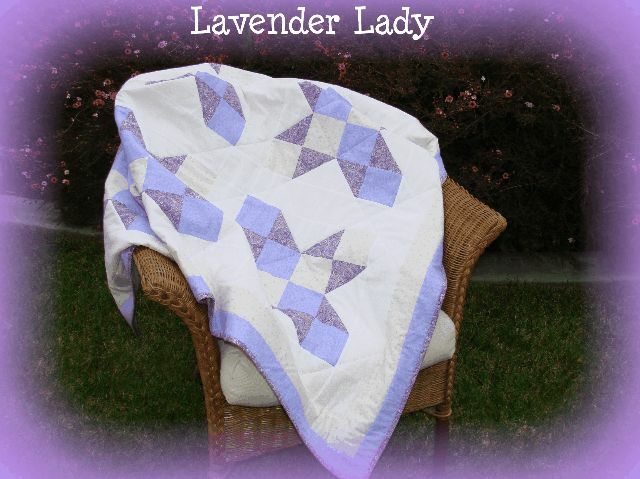 She also likes butterflies so when I decided to make her a quilt, it had to be purple first and somehow be related to butterflies. The block I chose is called "Winged Four Patch". I just loved the paisley print and used shades of purple to complement it. Unfortunately, the purple appears somewhat blue in the photos...I had a terrible time trying to capture the true color. But you get the idea. just a few months from start to finish which was a fairly quick project for me. The backing fabric matches the inner border and the lighter fabric on the diagonal of the main block. I just wanted her to have something to keep her cozy and warm while reading a good book!